1. Heat a frying pan over a medium heat and toast the walnuts until golden. Place in a bowl with the celery, chopped apples and halved grapes. 2. 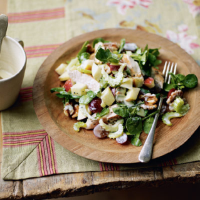 Make the dressing by mixing together the yogurt, mustard and lemon juice. Season and toss with the salad. 3. Heat a griddle pan over a medium-high heat. Cut the chicken breasts in half horizontally, brush with the oil, season and cook for 1-2 minutes on each side. Slice and gently toss into the salad with the watercress. Serve immediately.